With the publication of Cataveiro in February, I’ve been busy scribbling a few guest posts, so here’s the links, with many thanks to the bloggers who have kindly hosted me. A guest post on Post-Ecological Politics in The Osiris Project. A guest post on Life After Publication. A guest post on Inspiration in Translation. A twist on The Ladies Survey (on women and the internet) with Kameron Hurley, Jim Hines and Tobias Buckell. Elsewhere, the marvellous folk over at Starship Sofa have done an audio version of all the shortlisted works for this year’s BSFA Short Fiction Award, including Saga’s Children, beautifully narrated by Trendane Sparks. Here’s the link to listen. Lastly, a lovely mention for Osiris in the latest video from vlogger Rosianna Halse Rojas – and in great company too. I’m now in the final sprint to finish up the manuscript for Book 3 of The Osiris Project. A book recs update is well overdue here, but it will have to wait a few more weeks. I’m also persevering (wading? swimming whilst desperately trying to keep head above water? I’m not sure what the appropriate verb is for this mad genius book) with Roberto Bolaño’s epic but utterly unrelenting 2666. Thoughts to follow. This entry was posted in Guest posts, Interviews, short fiction, Writing life on April 11, 2014 by E J Swift. 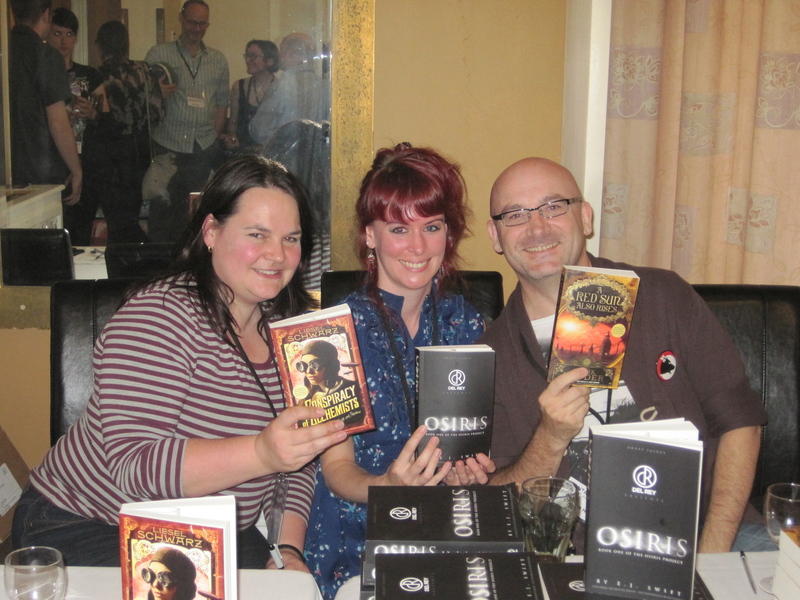 Somewhat belatedly, evidence of me, Liesel Schwarz and Mark Hodder at the Del Rey UK launch at FantasyCon in Brighton. This was a lovely day. I met up with Liesel beforehand at London Victoria. Thanks to the vagaries of Southern Rail cancellations, we spent the journey down to Brighton sitting in the luggage rack (never say there’s no glamour in publishing), but all was worth it when we arrived and got to see proofs of our books for the first time. The OSIRIS cover artwork was still being tweaked, so Del Rey had produced a short run of this cool black and white cover. Needless to say I nabbed copies of Liesel’s and Mark’s books (A Conspiracy of Alchemists, and A Red Sun Also Rises respectively), both of which look fantastic – I can’t wait to read them. 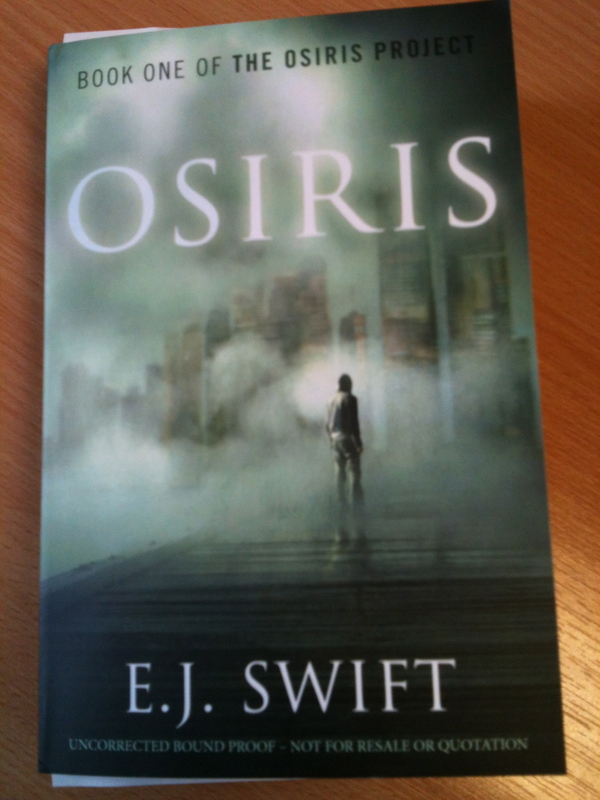 This week, I was sent a new proof of the UK OSIRIS with the actual cover. Isn’t it pretty! It’s released in the UK on 7 February 2013, and you can pre-order from Amazon here. Lastly, here’s a link to an interview with fellow Night Shade author Paul Tobin as part of his author-to-author series. This was a really fun one and he’s also interviewed Jeff Salyards, Adam Christopher, Chris Roberson and others as part of the series, which you’ll find on the blog. This entry was posted in Conventions, Del Rey UK, Interviews, Osiris and tagged Del Rey UK, FantasyCon, OSIRIS on November 2, 2012 by E J Swift.